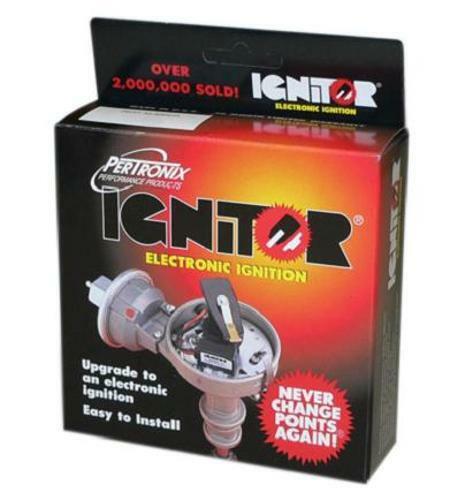 New Pertronix Ignitor Electronic Ignition Conversion for 66-77 Classic Ford Broncos with 170 or 200 ci 6 Cylinder engines. 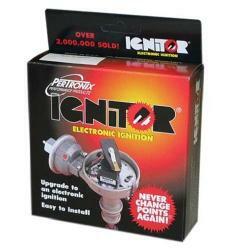 For over thirty years, the Ignitor has proven itself in applications ranging from race cars to tractors. The Ignitor replaces breaker point and troublesome factory electronic ignitions with a dependable, self contained and maintenance free electronic ignition system. The Ignitor has been called the "stealth" ignition because of its quick installation and nearly undetectable presence under your distributor cap. Delivers twice the voltage to the spark plugs, increasing horsepower, fuel economy, and spark plug life. 2:1 improvement over points in current fall time for increased coil output. Rotating cobalt magnets trigger a Hall Effect integrated circuit . ...no points to burn, ...no moving parts to wear out. Epoxy molding makes this module impervious to dirt, oil, grease and moisture. Fits entirely inside the distributor. No "black box" to clutter the engine compartment. Stable timing ...no need for any adjustments. Legal in all 50 states and Canada. Guaranteed for 30 months.